Respect for family is very important to Edwin. He is loyal to his friends and plans to promote a better Simskind. The Bring Me To Life Challenge by @Buttonsginger inspired the creation of Edwin. He will be playing thru a series of missions in the challenge with a few twists of my own thrown in for flavor. He moved into an apartment in the Art District of SanMyshuno so he can work his way through the Art Critic career. As posted above Edwin will be playing thru several missions inspired by BGs Bring Me To Life challenge. They will be in no particular order and may overlay prom time to time. 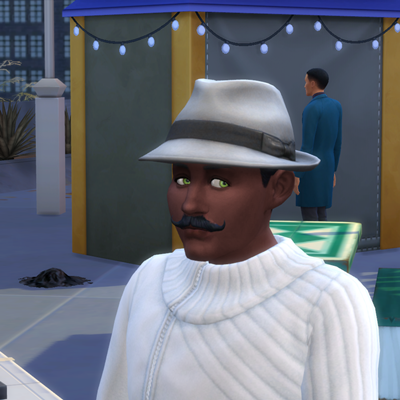 His first test begins in the Winter in San Myshuno. I am actually not going to make him start as a homeless person. He moved into an apartment in the Art District and after meeting a few Sims started a career as Critic. Lifespan normal with youth potion to keep Edwin young. Prime goal - complete first three milestones of City Native Aspiration. "Grand Steward of the Art". To advance in this career skills in writing, painting, music and comedy are required. Side goals - Practice writing and advance in the Best Selling Author aspiration. Almost forgot to mention Edwin completed the Snow Globes collection. 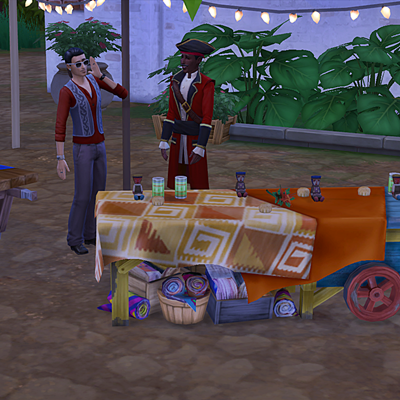 A random Sim was selling them on a table near the food vendor in his neighborhood. Edwin has mastered the writing skill, achieved level 9 painting and level 6 for charisma, comedy and singing. 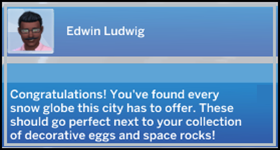 He completed the first three milestones of the City Native aspiration. One of the last goals is to live in an apartment worth §100,000 and Edwin has just under §50k on hand. I really want to move out of the city and have not decided if I will complete that step or not. Only two bestsellers remain to complete the Bestselling Author aspiration and he is level seven of the Art Critic career. Best Selling Author / Poetic trait earned. Painter Extraordinaire / Expressionist trait earned. I liked the apartment floorplan so I copied the rooms and converted them into a house for Edwin at Rippling Flats in Newcrest. Edwin has been assigned the task of searching for treasures in the jungle... dressed as a pirate. 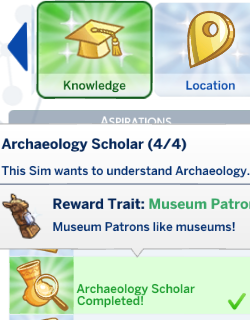 I love the archaeology aspiration. Edwin now receives artifacts by mail on a regular basis to be authenticated. 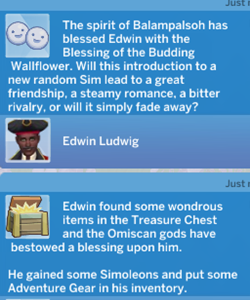 He can then choose to mail it back for a hefty bonus of three to four thousand Simoleons! I keep forgetting to pull them into his inventory before sending them back. I think I am missing counting them towards the collections. In any case another person with any archeology skill can also mail them back. 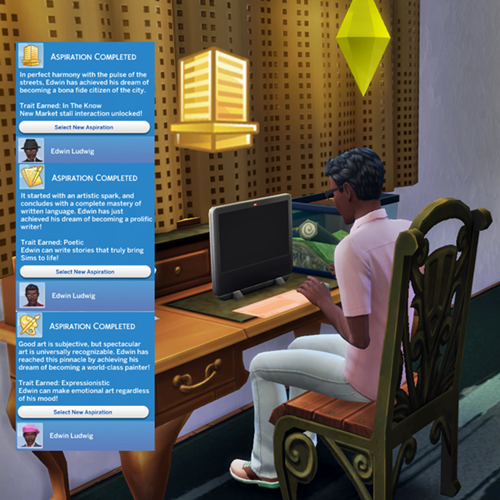 Then that Sim gets credit towards the Fabulously Wealthy aspiration. 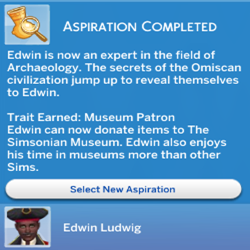 Since Edwin has already completed five aspirations it is time to bring in some new blood. She is making great progress in the gardener career and is already level 8/Botanist. She has level 10 gardening skill. 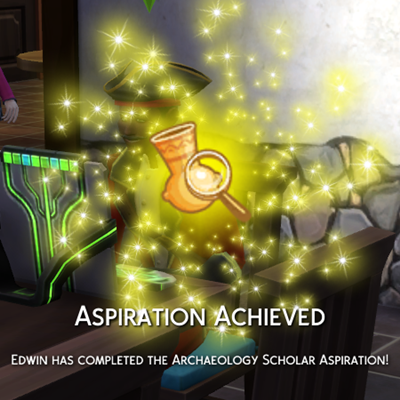 Plus completed the Freelance Botanist and Curator aspirations. 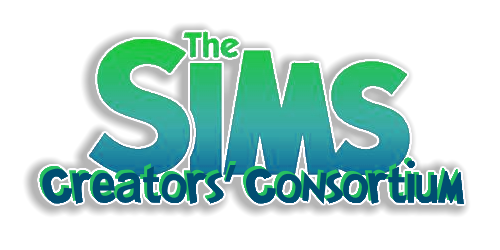 I'm glad to see you are still having a lot of fun with Sims. I still find the game fun and interesting. 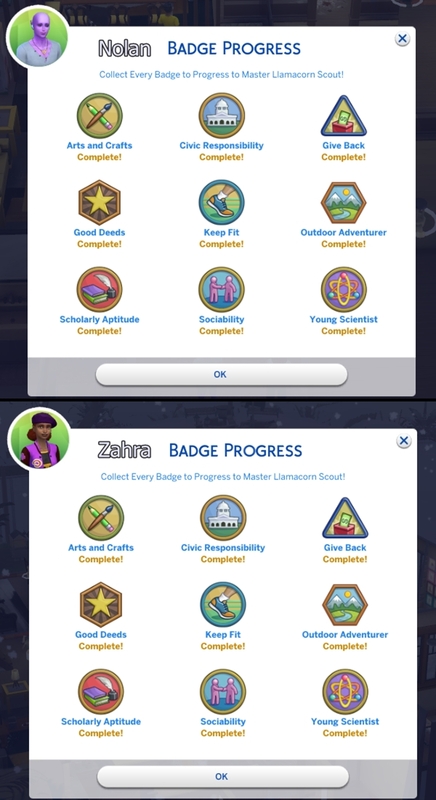 Sims4 Seasons reintroduced the Scouting program for kids and teens. By doing everyday activities they earn various badges to become a Master Llamacorn Scout. 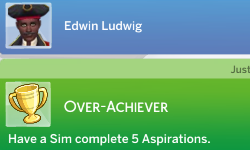 This achievement also counts towards the Renaissance Sim achievement when they become a teen.